Preface: a bee in the hand -- Introduction: the buzz about bees -- A vegetarian wasp -- The living vibrato -- Alone together -- A special relationship -- Where flowers bloom -- Of honeyguides and hominins -- Keeping Dumbledores -- Every third bite -- Empty nests -- A day in the sun -- Conclusion: the bee-loud glade. From the award-winning author of The Triumph of Seeds and Feathers, a natural and cultural history of the buzzing wee beasties that make the world go round. Bees are like oxygen: ubiquitous, essential, and, for the most part, unseen. While we might overlook them, they lie at the heart of relationships that bind the human and natural worlds. 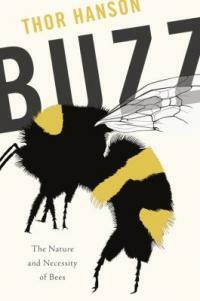 In Buzz, the beloved Thor Hanson takes us on a journey that begins 125 million years ago, when a wasp first dared to feed pollen to its young. From honeybees and bumbles to lesser-known diggers, miners, leafcutters, and masons, bees have long been central to our harvests, our mythologies, and our very existence. They've given us sweetness and light, the beauty of flowers, and as much as a third of the foodstuffs we eat. And, alarmingly, they are at risk of disappearing. As informative and enchanting as the waggle dance of a honeybee, Buzz shows us why all bees are wonders to celebrate and protect. Read this book and you'll never overlook them again.